Co-authored with Ellen M Martin and Tiffany Simms. In researching the state of autoimmune disease from a patient perspective, I have uncovered multiple gaps across the care continuum. Despite the fact that at least 24-50 million Americans are living with autoimmune diseases and they are among the top ten causes of death among U.S. women younger than 65, it still takes most patients an average of 3.6 years and 5 doctors to get a diagnosis. An AARDA survey found that most family physicians feel undereducated and uncomfortable diagnosing autoimmune patients. Further, these patients present with a variety of vague symptoms affecting different parts of the body. As a result, most patients shuttle through multiple specialists (dermatologists, gastroenterologists, rheumatologists) before the autoimmune nature of their complaints is recognized. Once diagnosed, treatment is still too often guided by trial and error. The promising biologicals developed since the 1990s and approved for several specific diseases (IBD, MS, RA, psoriasis) do not work durably in many patients. Additionally, we have no biomarkers to guide initial treatment choice. For many diseases, toxic general immunosuppressives remain the standard of care despite 20 years of attempts to develop more precise biologicals (e.g., Lupus has been the target of dozens of failed attempts to get a drug approved over the past 20 years). 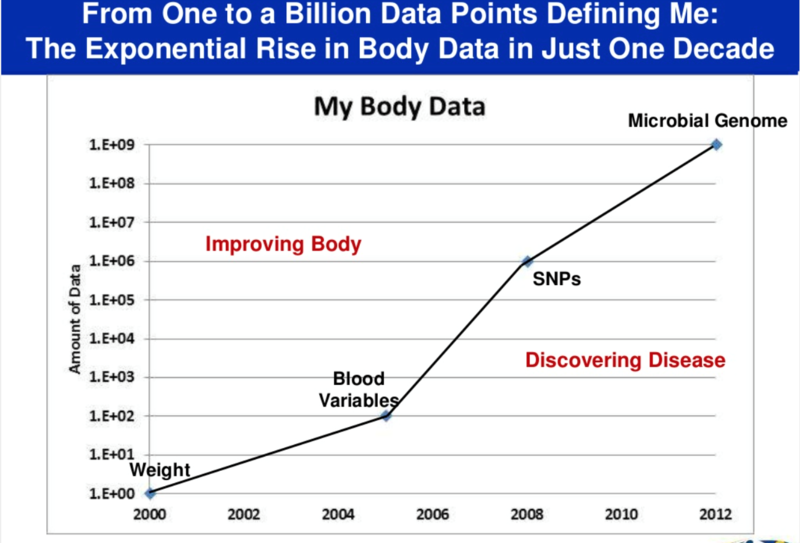 Alongside the exponential rise in data shown below, progress in digital data capture and analytics is enabling relevant research in genomics, immunology, systems biology, and microbiomics. Microbiomics is the study of the trillions of microbes in and on us. Converging research points to the gut, our largest immune organ, as a bridge between body and brain, perhaps through the mediation of microbiome responses to food, infections, and antibiotics. Microbiomics is both a research focus to explore commonalities of autoimmune diseases and an opportunity for patients to treat themselves now with gut-level interventions like diet and stress management. Connecting those complementary goals, pioneers are advancing microbiome research through self-quantification. One of these pioneers is Larry Smarr, the Harry E. Gruber Professor of Computer Science and Engineering at the University of California San Diego, and the founding director of the California Institute of Telecommunications and Information Technology (Calit2). The simplest time series is a sequence of at least three data points, typically consisting of successive measurements of the same phenomenon, over multiple time intervals. 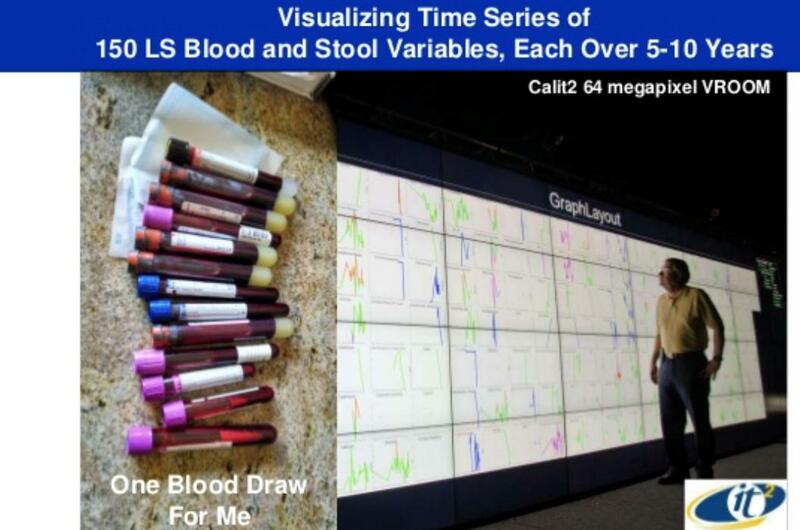 These can be as simple as a spreadsheet of observations recorded on specific dates or they can rapidly approach big data if multiple phenomena and frequent or long-term measurements are collected. Our current understanding of autoimmune diseases is that patients’ immune responses are misdirected against their own tissues, however, we do not really understand what causes autoimmune disease. In most cases, we do not even have an idea of the correlative triggering events (infections, change in diet, hormones, environmental exposure). Subsequently, we do not know how or why people alternate between flares and symptom remission. 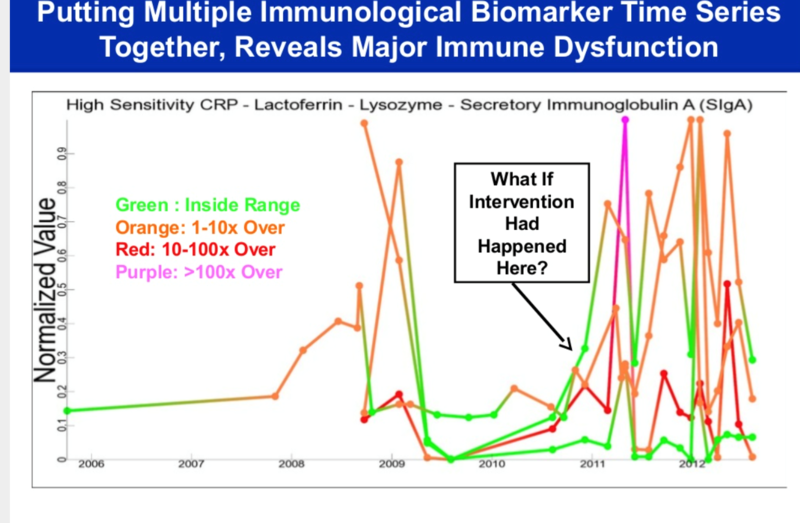 If we could track biomarker activity against symptoms over time on an individual level, as shown in the “Immune System Dance” below, perhaps we could begin to see patterns from the bottom up. Aggregating these individuals’ patterns and by looking at population-level patterns, (a top-down view), we could discover new patterns pointing to the underlying causes and triggers of disease. Larry is currently working with Dr. Sandborn at UCSD, who is setting up a clinical BioBank with hundreds of patients with Inflammatory Bowel Disease, as well as healthy controls. The goal is to begin to correlate, in detail, biomarkers (measurable chemical signatures in blood or tissues) and microbiome populations to find which are correlated with different phenotypes (the observable characteristics) of disease conditions. 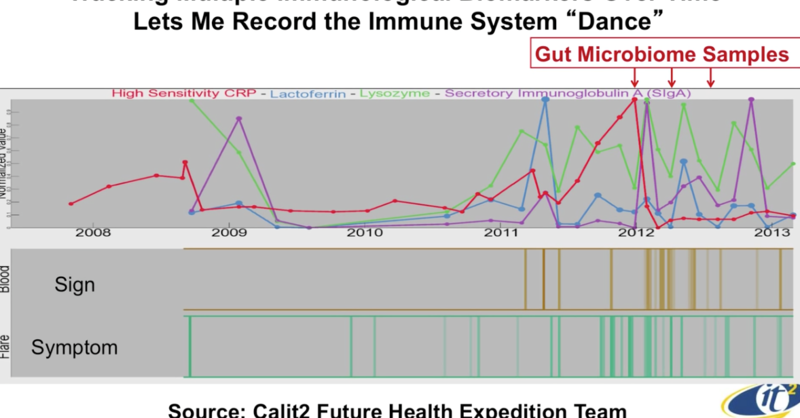 While the subjects will not be tracked as often as Smarr does, the ability to study time changing patterns across a large population of different autoimmune subtypes should lead to a much clearer picture of how the microbiome interacts with the human immune system over time. In using bottom-up techniques, researchers are in the process of utilizing individual patient data to create big data libraries. These libraries will allow fine-tuned analysis and understanding of patient needs and timing of therapeutic interventions. It is hoped this will help reduce the gaps in Autoimmune Disease diagnosis and treatment. This post is a modified version of one that originally appeared on Dr Bonnie 360 on 02/22/15 post. It is republished here with permission from the authors. Thanks,Bonnie Feldman. Lot of Peoples are impacted by disease.So Your Post is usefull.Thank you so much.Keep It up!